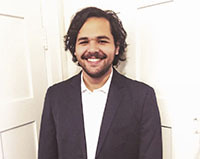 Below is a transcript of the speech given by Nicolas McKee Castellanos, who was selected to speak on behalf of the Seattle University School of Law J.D. class of 2018. Thank you Dean Deming for that wonderful introduction that makes me sound a lot cooler than I actually am. Good morning graduates of the Class of 2018, alumni, professors, administration, maintenance staff, family, and friends who have come from near and far. A special shoutout to my amazing family who came from Phoenix, San Francisco, and Mexico; community members, prospective employers (if you are one, check under your seat for my resume, cover letter, legal writing sample, and a list of references—I swear they are pretty good), and any other people who are joining us today. Thank you all for being here today as we celebrate something beautiful and amazing. We are at the point we’ve been looking forward to for three-plus years now. The last inch of the diving board before we jump off. Nothing but anxiety and inevitability left to deal with. I’ve struggled lately with describing this feeling as my own imagery only touches the surface of the feeling. And in between the questions about my future, the strange faces people make when I tell them about my student loans, and my own periods of personal reflection, I think I’ve found a simple, easy, and honest way to explain it: I have no idea what I am doing right now. We may be well-prepared, well-spoken, well-meaning, and extremely knowledgeable. However, there is still something missing, something that causes us to put our face in our hands or on the shoulder of a loved one and ask, “What am I even doing?” Everyone in this place has asked that question, and to a certain degree, continues to ask it. There is beauty in this question though; color in all the chaos it brings us. It brings us strength, unadulterated and pure strength. The feeling in your stomach when you turn on the news and see something that lights the flame inside you, that which gives you the ability to overcome any obstacle, like staying up all night at Sea-Tac helping immigrants and refugees, like staring construction crews and private security in the eye while you protect sacred lands at Standing Rock, like supporting friends as they struggle with their own personal demons and for their own causes. Strength gives us all a unique reason to fight. I’d like to tell you a story that helped me realize what that meant to me. A year and a-half ago, I was told by my family that my grandfather was dying, and the clock was running on getting an opportunity to see him one last time. Within an hour I had a plane ticket purchased to Guadalajara, Mexico, and promised myself I would stay strong. I spent the weekend with my family huddled in his room stuck between the medical equipment and his nurse. He could barely speak and spent most of his time sleeping and whispering into my grandmother’s ear. Time is cruel though, and eventually I had to fly back to Seattle to make it to my class on Monday morning. As I was preparing to leave, I went into his room for what would be the very last time I would get to see him. I leaned over his bed and tried to speak to him but struggled to communicate. My grandmother asked if I could understand him, I responded with an honest “No.” So my grandmother leaned down and listened to him, and she turned to me and told me “Tu abuelo te quiere decir que te quiere mucho, y si vas hacer un abogado, que lo haces con todo el esfuerzo y poder que tienes.” For the non-Spanish speakers out there this means, “Your grandfather wants to tell you that he loves you very much, and if you are going to be a lawyer, that you do it with all the strength and power you have.” He raised his fist to me (in the cheesiest way possible), and for the next 30 minutes I broke down. Throughout my 5-and-a-half-hour flight home, crammed into the aisle seat of a discount Mexican airline, I thought about what I was fighting for, what I was going to do. How was I going to use my esfuerzo, my poder? I am not going to lie, I struggled for a while with this futile effort. I struggled balancing the realistic expectations for what I could accomplish to the unrealistic superhero type fantasy of wanting to save the world. This overflowed into the next several months as I found myself fighting with depression and anxiety, trying to figure out why I was even in school, and what I could even accomplish should I manage to graduate, and even if I did graduate how I was even going to pass the bar. Even if I did pass the bar, how was I going to get a job? Even if I got a job, was it going to impact anyone at all? I ask myself those questions every day. Even after I accomplish each one of those, I’ll still ask myself those questions. However, if I have something, anything at all, to fight for, it’ll make it more than worth it, and there is more than enough to fight for right now. Every time we turn on the news we contribute to our own heartburn as the world seems to unravel before us. We are now uncomfortable, and the world we have grown too accustomed to pretending is perfect has begun to show itself for what it is. Every phobia and ism we have pretended is a topic of the past never stopped being a thing. That is the sad realization that many in our society have had to be reminded of every day. Many don’t have the privilege to pretend like nothing is wrong and to relax, as their lives are a consistent struggle for equity, equality, and representation. Many within our own class have had to navigate it themselves in one way or another through our short legal careers. Because of this, all of this, we must go out and find something to fight for, something to bleed for. We must effectuate change. We must do it in the courtroom, we must do in in the office, we must do it with our clients and their families. We must do it in the streets, we must do it at home. We must find something, anything, to fight for, and then everything else will fall into place. Whether it be for immigrants, our refugee and asylum communities and their fight for a better life, our brothers and sisters in the African-American community fighting for their lives, our LGBT and queer communities fighting for equality, the fight for a woman’s right to feel safe in their everyday life, the fight for reproductive rights, the fight for the soul of our political process, the fight for the safety of our educators and our youth at school, the fight for the rights and representation of our workers, the fight for the future of our own Earth—I could continue on for hours, but I believe I am limited on time, so you get the point. What I truly want to emphasize here is simple and not very deep at all. Find something, something that is good to fight for, and stand up for it no matter what. Fight through the blood, sweat, and tears, and never give up. We have this incredible opportunity right now, to be able to go out with these skills we have accumulated over the past couple of years and contribute to the betterment of our world in a way not a lot of people can. Every single one of you sitting before me today is more than capable of making unprecedented change, and you sure don’t need me to tell you how powerful your hearts and minds are now. Just remember, that when you are sitting there, when this journey has finally reached its end, and you question what it is you are doing, remember what you are fighting for and make sure you give it all your poder and all your esfuerzo. Great stuff. Would you be willing to help circulate the next dues rollback petition?